I promised you a picture of the cat on the desk. Here it is. Bert got very comfortable between the keyboard and the monitor. He likes being in the house when the dog's not here. But once Callie shows up, he's ready to head back down to the utility room and garage. Poor guy. What? You want to type something? Go ahead. I took a photo of Callie getting ready to pounce and it turned out very blurry. But what the heck, I'll post it for your enjoyment. Ready? I spy something that begins with "c."
When Callie sees Bertie, she just goes into a zone. Her eyes dilate and she starts to drool. It's like she goes into a trance or something. It's very strange. I don't think they will ever figure out how to get along. 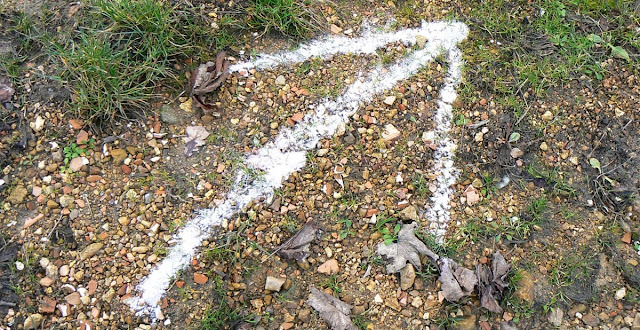 This is one of the chalk arrows left over from last weekend's randonnée pédestre (town hike). They're all over the ground in the vineyard. It takes a few rainstorms before they wash away. The arrows tell you which way to go when you get to an intersection. There are also big X's on the ground to indicate which way not to go. Some guy goes all over town the day before a walk and draws these arrows on the route. 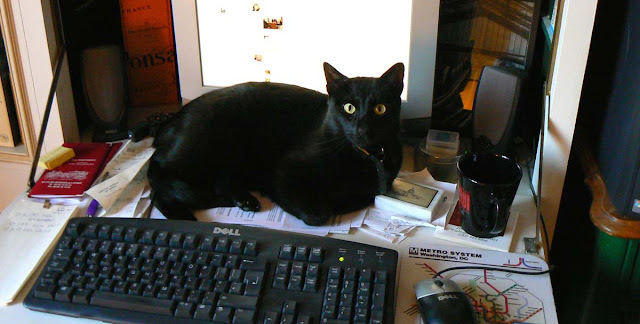 As I type this, Bertie is sitting on my desk between the keyboard and the monitor. He is watching my fingers very closely as they move over the keys. You should see him when I reach for the mouse. Ken took the dog out for the morning walk and tossed Bertie in the house for some "warm time." The garage and utility room get a little chilly on cold mornings like this. Mr. Bert was also in the house during last evening's walk and got to spend some time by the fire. Ooops. Now Callie's home. Camera time! All around us in the fields I see the remains of last summer's growth. Brittle reminders in brown and gray of what was and of what will come again. Ah, January. This month takes too long to pass, and when it does, we are stuck with February. Which is thankfully short, a mild consolation for having put up with January. 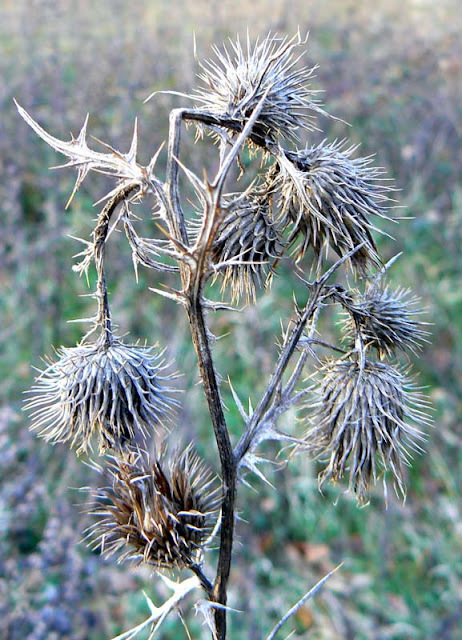 Come spring, this spent thistle in a nearby field will either fall or be mowed down. Still, there are signs. I see and hear more and more birds on morning walks. I see buds fattening up on trees and shrubs, and bulbs are starting to push up green stems. I'm glad the winters are mild here in our ocean-tempered climate (even though the ocean is four or five hours to our west, it still moderates our winter). Are you seeing any signs of spring yet? While I don't enjoy the slippery slope in the winter woods, Callie loves it. There's lots to smell out there. When I walk her in the afternoon, she turns right out of the back gate and heads directly down to this path. It's become our afternoon pattern. 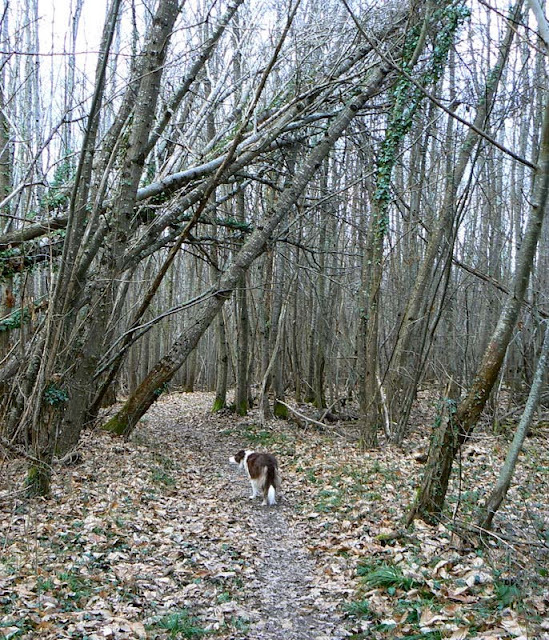 The path through the woods. Those trees blew over in the big storm last February. When I walk her in the morning, she turns left out of the gate and we head out into the vineyards. She's got me trained well. Each walk is nice in it's own way (except for the slippery mud). The vineyard walk is longer and flatter so I can walk at a brisk pace. We mix it up in good weather by meandering through and around the various vineyard parcels. The woods walk takes us down the hill and through a small residential section, then back up the hill on the paved road. That hill is rather steep and walking back up is a good workout for me. It reminds me a little of coming home from work in San Francisco and the big hill that I trudged up every evening. 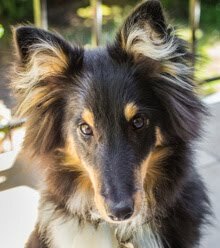 Walking is good exercise and if it wasn't for the dog I'm not sure I'd be motivated to do it every day. 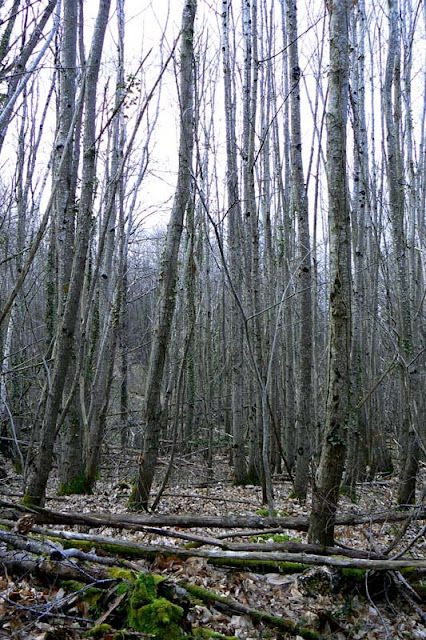 It won't be long before the buds and leaves appear, so we'll have to enjoy every day of these bare, cold, and gray woods while we can. They are pretty. In a picture. No, really. I can't tell you how many times I've nearly fallen flat on my keister because of wet and slippery fallen leaves on mud. How I long for dry ground. The woods north of our house, just across the vineyard. But seriously, folks. January has been drier than either November or December. But less wet is still wet, right? At least it's not snow. We need about a week of clear sunny days to even begin to dry things up. I noticed Bertie out on one of the neighbors' trash cans last week. Got the camera. Snap. Snap. Snap. He was enjoying the view and then suddenly jumped down and sauntered away. Just like a cat. 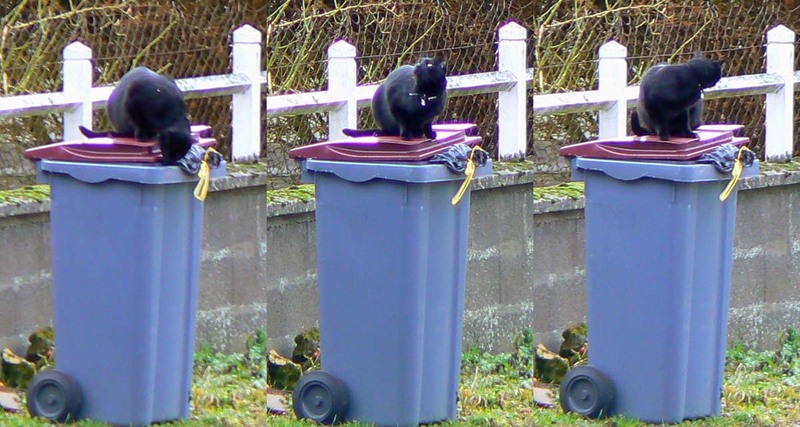 Bertie checks out a neighbor's trash bin. Thank goodness for zoom lenses. One of our other neighbors rang our doorbell early on Saturday morning. She's a young woman, probably younger than thirty, and we had never met her before. She asked if we had seen a small black kitten. Apparently he got out of the house and has gone missing. There was a cat fight near her house and when she opened the door to see what was going on, the kitten got out. She has several cats, she told us. She also has chickens. I asked her if she ever saw Bertie in her yard and she said yes, but that he wasn't involved in the fight. There are now at least seven cats in our neighborhood that I know of. At least during the fall and winter. A week ago Sunday the guys held one of their battues (organized hunts). 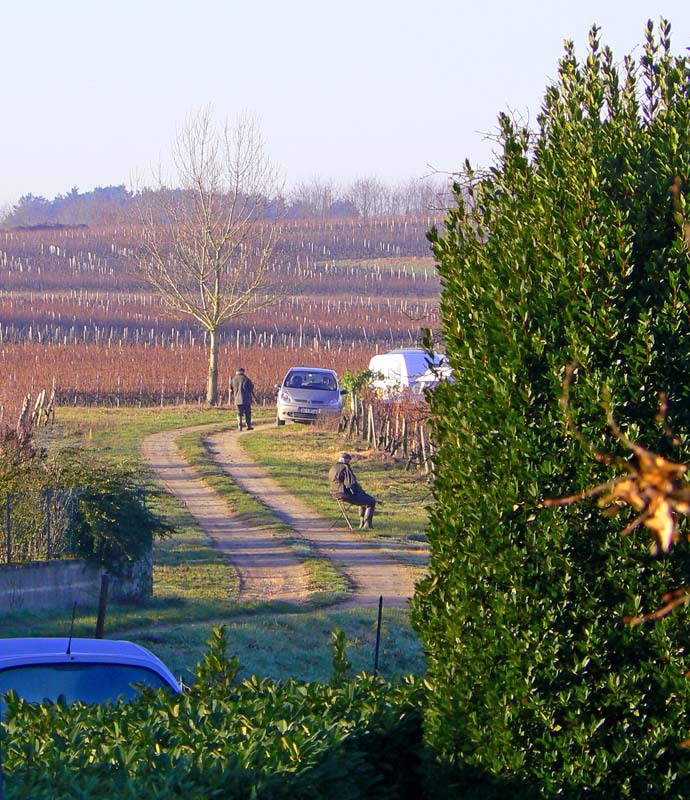 They come together at strategic spots with dogs and drive the game from one area of the woods and vineyards to another. This concentrates the scared critters so they can be shot by the guys waiting on the other side. 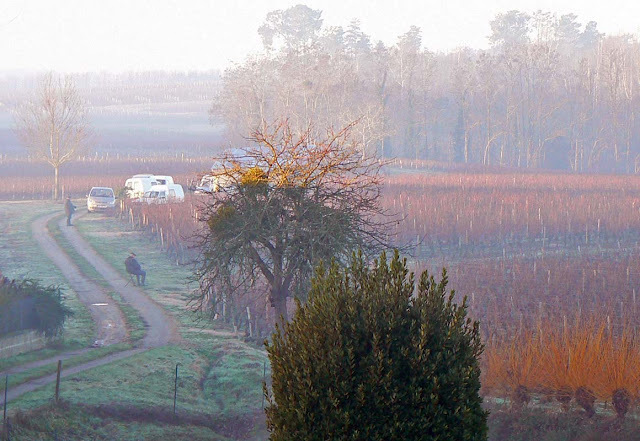 The hunters parked and positioned in the early morning fog. View from our house. It hardly seems fair, but I'm told it's necessary once in a while to keep the fox or roe deer populations down. Normal individual hunting is usually about rabbits and pheasants and other small game. I don't think the individual hunters are allowed to take deer on their own. This guy's got his folding chair as he waits for the prey. The fog cleared away. Last weekend our vineyard* was the end point of the chase. About twelve cars barreled through and parked out there while Callie and I were on our morning walk. The hunters took up positions along the road and at various points in the vineyard. I asked one hunter I passed if they were going for fox or deer. Deer, he said. I could hear the dogs barking through the woods a couple of roads over. Callie and I scooted home quickly. Don't want to be caught out there with hunting dogs, scared critters, and guys with guns. It's all over pretty quickly and all the guys leave. Hunting season should be ending pretty soon, except for a couple more battues through February. * I say "our vineyard" in the sense that it's behind our house. We don't own the vineyard. This is the last of my images from Chicago. And I think it's appropriate: getting into the taxi for the journey home. I took this outside the Hyatt Regency Chicago on East Wacker Drive, along the river. I really liked how the bellmen were reflected in the glass above their heads. Thanks for indulging my little detour to the Windy City. In these dark winter months I tend not to have a lot of opportunity for interesting photos. It depends on the year, of course, and what's going on. But aside from the holiday markets I haven't got out much. We'll see what the coming weeks bring. 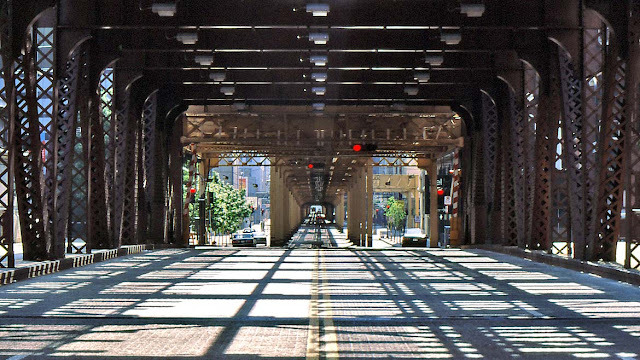 This is the sixteenth and final in a brief series of photos that I took while visiting Chicago in June 1996. They're 35mm color slides that I've scanned and digitized. This statue is in the lobby of an office building in the Chicago Loop. I don't remember which one. I don't know what the statue is called or who sculpted it. 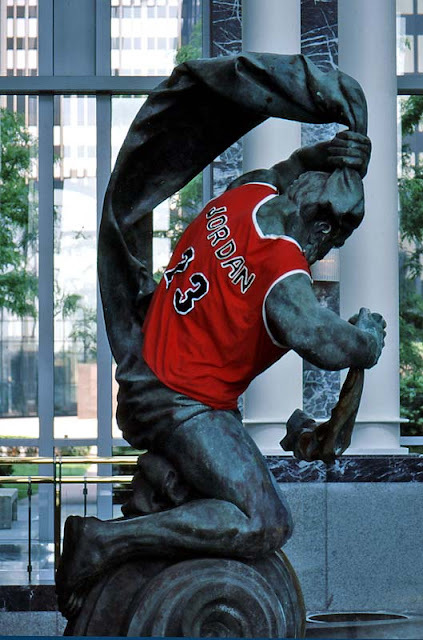 But when I saw that someone put a Michael Jordan jersey on the statue, I just couldn't resist a photo. The building was closed as it was Sunday. I took the picture through the glass windows of the lobby. I really like how the red of the jersey just makes the picture dynamic. Don't ask me to explain what I mean by that. I think I have one more photo from Chicago that I want to share after this. Then I'll stop and we'll return to winter in France. You have been warned. This is the fifteenth in a brief series of photos that I took while visiting Chicago in June 1996. They're 35mm color slides that I've scanned and digitized. 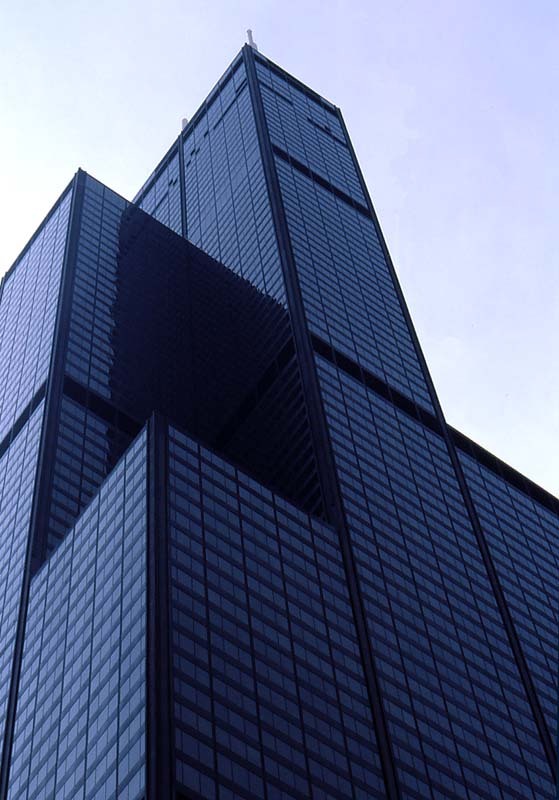 For now this is the tallest building in the United States at 108 floors and 442 meters. It was renamed in 2009 when a new tenant, Willis Group Holdings, Ltd. of London, obtained the naming rights in their lease negotiations. Sears' contract for the building's name had expired in 2003 (Sears sold the building in 1994, but kept the naming rights for a while). I can't bring myself to call this the Willis Tower. The tower was completed in 1974 and at that time it was the world's tallest building and remained so until 1998. I remember going up to the 103rd floor observation deck once, but I have no pictures from up there, so it must not have been in 1996 when I took the rest of this series. Besides, the new glass balconies were not yet installed then, so I have two good reasons to go back. This is the fourteenth in a brief series of photos that I took while visiting Chicago in June 1996. They're 35mm color slides that I've scanned and digitized. We were in Chicago during the 1996 National Basketball Association (NBA) finals. Not on purpose; it just worked out that way. The Chicago Bulls hosted the Seattle SuperSonics for a best of seven series. The Bulls were a real hot team in those days and their star player, Michael Jordan, was about as big as you could get. 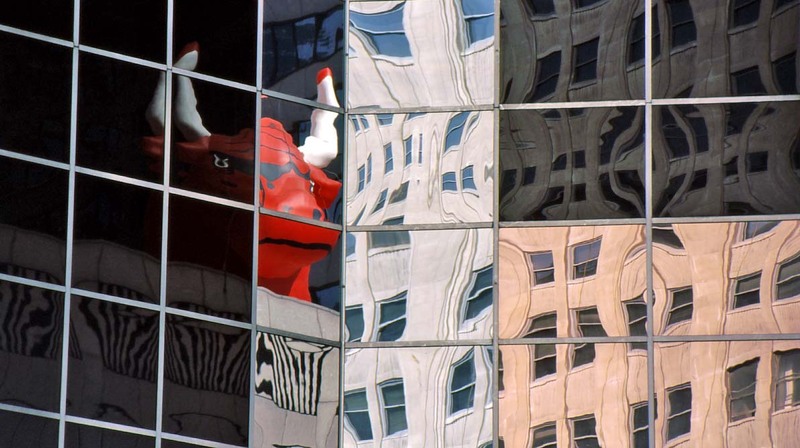 A menacing Chicago Bull reflected in downtown glass. The streets were full of "Go Bulls" kinds of things, including this giant inflated bull on top of one of the buildings in the Loop. I caught its head reflected in some glass windows on a nearby building. It just occurred to me that this may have been somewhere near the Chicago Board of Trade and may have had nothing to do with The Bulls, but with the commodities market. Hmmm. At any rate, the Bulls won the series four games to two and became national champions that year. This is the thirteenth in a brief series of photos that I took while visiting Chicago in June 1996. They're 35mm color slides that I've scanned and digitized. Chicago's mass transit system is referred to as the "L." I think this comes from the word "elevated," as much of the system runs on elevated right-of-way through the city. According to my brief research, the "L" is the second oldest and second longest rail mass transit system in the United States (after the NYC subway) and the third busiest system (after NYC and Washington DC Metro). I really liked the pattern of the shadows on the bridge's roadway surface. The most distinctive feature of the "L" is the downtown Loop, around which most of the system's lines run in the center of Chicago. I took this photo somewhere on the edge of the loop on a bridge across the river. I don't remember exactly where, but it could be either North Wells Street or West Lake Street. If any of you recognize it, please let me know. This is the twelfth in a brief series of photos that I took while visiting Chicago in June 1996. They're 35mm color slides that I've scanned and digitized. Of the Chicago River, that is. This shot is taken from the confluence of the three main branches of the river. I think I was standing on Wacker Drive looking roughly north and a little west. The bridge that's open is the Kinzie Street railroad bridge (apparently it's no longer in use and is now locked permanently in the open position) and the lighter colored closed bridge is West Kinzie Street. Not a typical view of Chicago. 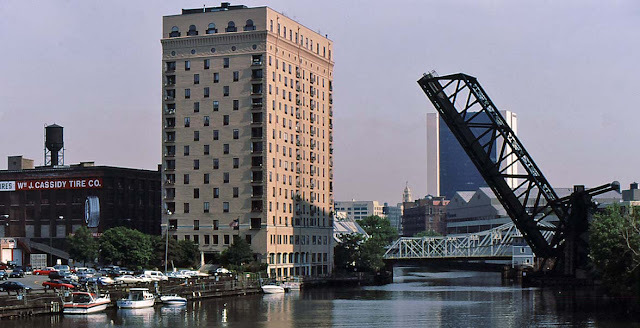 This is the North Branch of Chicago River in 1996. The curious thing about the Chicago river is that engineers reversed its flow in the nineteenth century by building the Chicago Sanitary and Ship Canal. 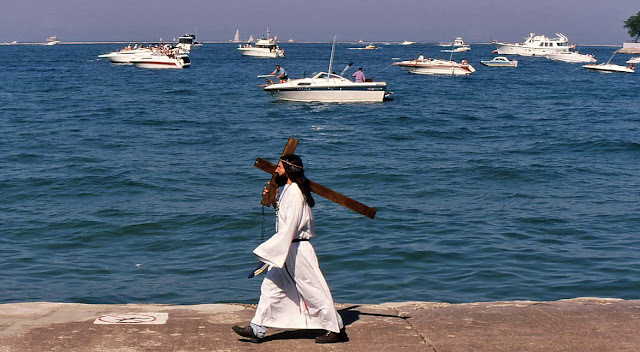 This connected Chicago and the Great Lakes to the Des Plains River and on to the the Mississippi River and the Gulf of Mexico. Before that, the river drained into Lake Michigan. Now it flows the other way, except for the North Branch that continues to flow southward. Confused? Wait until you see the river dyed green on Saint Patrick's Day. This is the eleventh in a brief series of photos that I took while visiting Chicago in June 1996. They're 35mm color slides that I've scanned and digitized. I love planetariums. Or should that be planetaria? My Webster's Unabridged says both are correct. When I was in school, one of my classes took a day trip to New York to visit the Hayden planetarium in Central Park, the one that was subsequently seen in Woody Allen's movie Manhattan. I was mesmerized. And amazed at that double-headed projector they used to put the stars up on the domed ceiling. 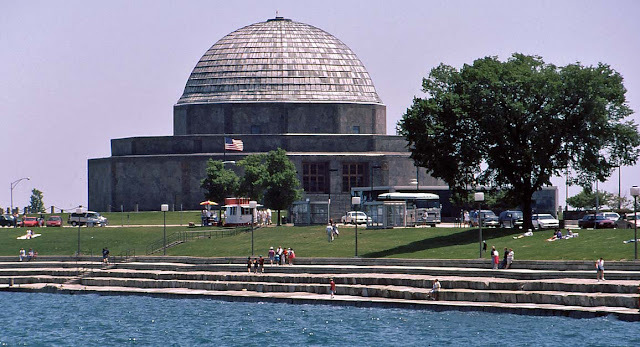 The Adler planetarium before its 1999 expansion. I've also been to sky shows in the planetarium at the Palais de la découverte in Paris. And I think I've been to one or two other planetariums, but I can't remember where. I haven't seen a show inside this one, however. It's Chicago's Adler planetarium. I did walk in and look at the exhibits back in 1996, but didn't have the time to reserve a spot in the theater. I read that the Adler is the oldest planetarium in the western hemisphere having been built in 1930 (five years before New York's Hayden). Three years after I was there, the museum expanded and added a third theater. I haven't been to a planetarium show since 1982, so I'm overdue! 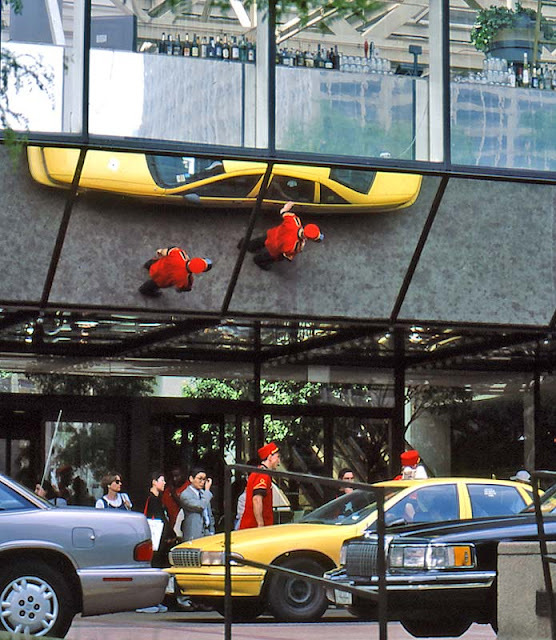 This is the tenth in a brief series of photos that I took while visiting Chicago in June 1996. They're 35mm color slides that I've scanned and digitized. Where do I begin with such a place? Especially when I've never really explored it. I think we walked out to the end and had a beer in a café (or maybe it was called a beer garden) once. But I've never been to any of the attractions on the pier, and there are many. 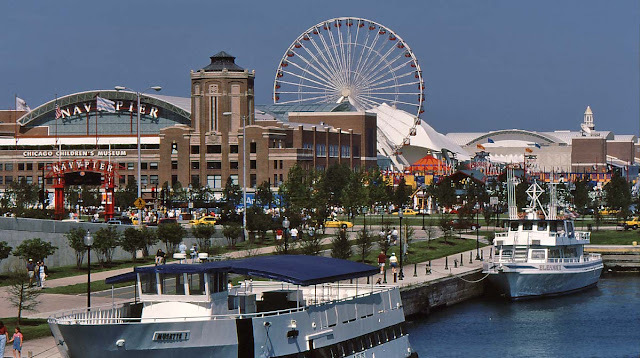 A view of the entrance to Chicago's Navy Pier. The pier was built in 1916 and reaches out over a kilometer into Lake Michigan. It was originally planned as part of a larger waterfront development and as a center for shipping and warehousing activities. It served as a military base during the first World War and was subsequently named "Navy Pier." Today it is a vast public space filled with attractions that include a giant Ferris wheel, a children's museum, an IMAX theater, parks, gardens, restaurants, and general exhibition halls. It's also the embarkation point for numerous lake cruise operators. Quite an impressive place at 200,000 square meters (more than 50 acres). This is the ninth in a brief series of photos that I took while visiting Chicago in June 1996. They're 35mm color slides that I've scanned and digitized. Not really. It has forty-one floors and tops out at one hundred seventy-seven meters, so it's not one of the taller buildings in Chicago (although it's almost as tall as the tallest building in my home town). It is, however, one of the more distinctive bits of architecture in the city because of its slanted diamond-shaped roof. 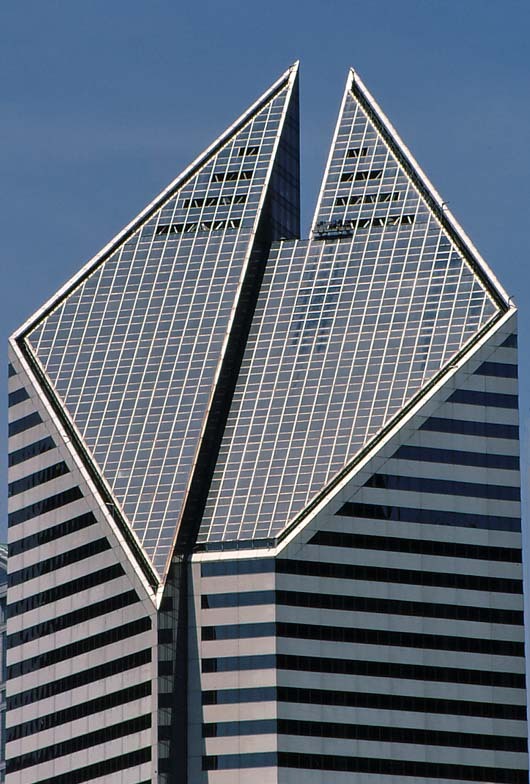 Smurfit-Stone's distinctive slanted roof looks like it's been slashed through the middle. It's called the Smurfit-Stone building (completed in 1983), home to a large container and packaging corporation. The building's prominent location on Michigan Avenue makes it easy to identify from Grant Park which, if my memory serves, is where I was when I took this picture. This is the eighth in a brief series of photos that I took while visiting Chicago in June 1996. They're 35mm color slides that I've scanned and digitized. Shouldn't he be walking on the water? 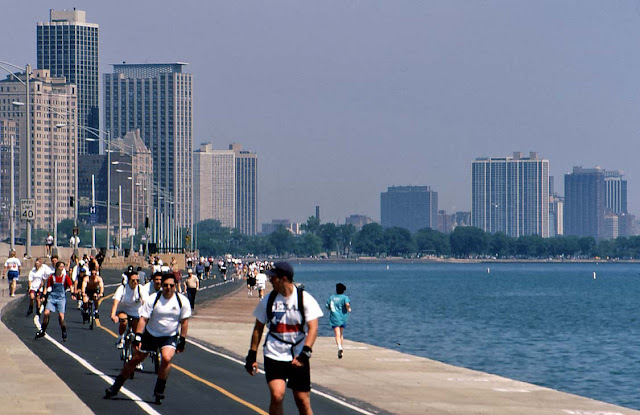 Like I said in a previous post, watching the people on the lakefront trail in Chicago is entertainment in and of itself. I wasn't there long enough to see Elvis go by, but I did get to see Jesus. I never realized that he had such a small, uh, cross. I also noticed his stylish work boots and Jesus jeans. This was a hot summer day. Christ, he must have been suffering under all that. But hey, that's his shtick, isn't it? Lordy. 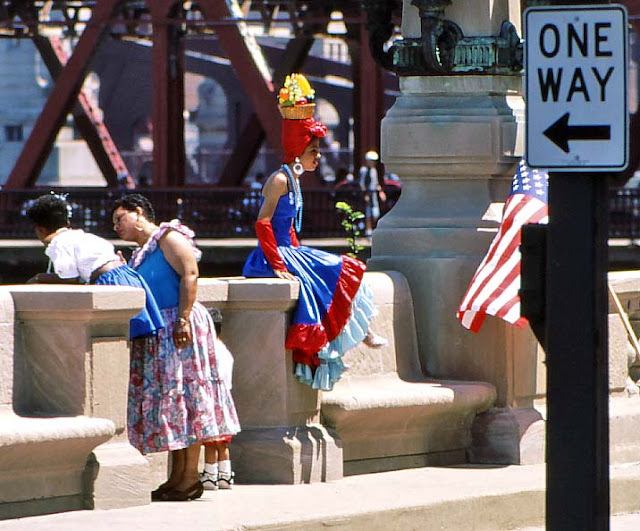 This is the seventh in a brief series of photos that I took while visiting Chicago in June 1996. They're 35mm color slides that I've scanned and digitized. I know, those photos of tall buildings get kind of samey. So here's a shot of what our weather has been like lately. We seem to be out of the big chill and into more seasonable, if not warmer than seasonable, weather right now. A recent sunrise seen from out in the vineyard. It's a nice change and it makes us think that spring is on the way. We even went to a garden center yesterday to get seeds for early lettuce crops. I'm hopeful that we'll be able to plant some lettuce and escarole in March. We have fabric tunnels to protect the little plants from the cold. We shall see. 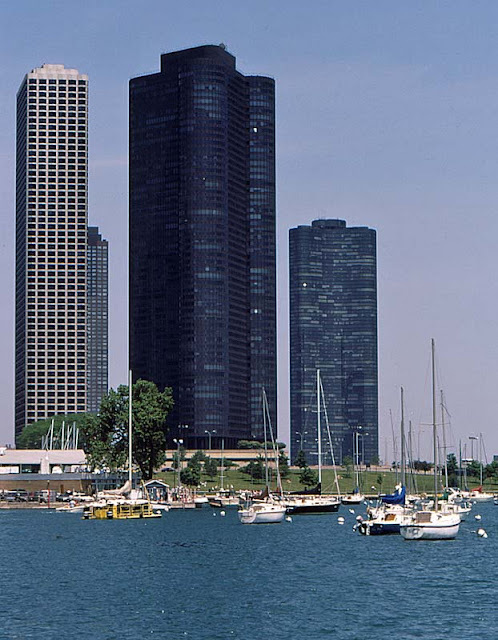 There are two similarly distinctive towers on Chicago's central waterfront. Each is a residential tower and each has the word "point" in its name: Harbor Point and Lake Point. The former is the newer, completed in 1972. It stands 168 meters tall with 54 floors. Harbor Point (center) and Lake Point Tower (right) on Chicago's waterfront. The latter (and in my opinion the more graceful of the two) was completed in 1968. Its 70 floors reach up to 197 meters. I read that it has the distinction of being one of the shortest buildings with so many floors. Lake Point Tower is also the only skyscraper that stands east of Lake Shore Drive. I just noticed that most of my Chicago pictures are taken in "portrait" mode as opposed to "landscape" mode. That's a testament to the verticality of this city. Or at least to the way I saw the city in 1996. This is the sixth in a brief series of photos that I took while visiting Chicago in June 1996. They're 35mm color slides that I've scanned and digitized. The Chicago lakefront is amazing. There is so much going on, and that's just downtown. This is part of the lakefront trail looking northward from near the Oak Street Beach. Walk, jog, skate, or bike, the choice is yours! Those trees you see are in Lincoln Park, north of downtown. Click to lakeshorify. You can also choose, as I did, to just sit and watch all the people go by. It was an amazing show. And the backdrops: on one side the vast blue of Lake Michigan and on the other the grand wall of the Chicago skyline. This is the fifth in a brief series of photos that I took while visiting Chicago in June 1996. They're 35mm color slides that I've scanned and digitized. On the day in June '96 when I walked around downtown Chicago with my camera, I stumbled upon a festival parade. I don't remember what it was commemorating, but it was colorful and joyfully noisy. I was along the river, I remember, trying to cross both the river and a street (Wacker Drive?) through the crowd. I made it. And along the way I saw these people taking a break from the fun. Outfits like this make me think of Carmen Miranda. Or at least that one number she did in that one movie that made her an icon in a fruity hat. This is the fourth in a brief series of photos that I took while visiting Chicago in June 1996. They're 35mm color slides that I've scanned and digitized. 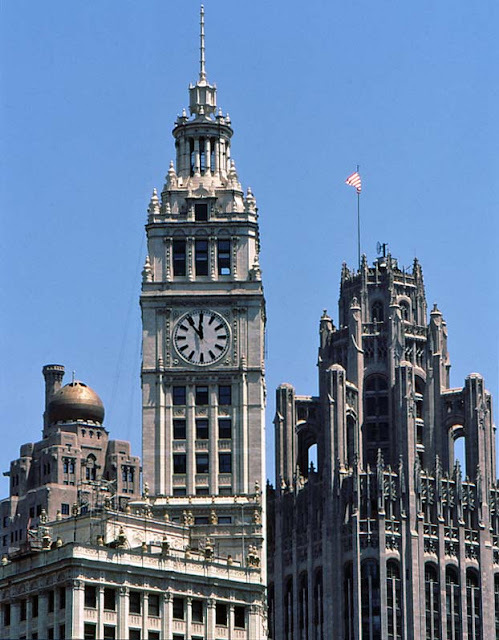 Each of these three Chicago landmark buildings was completed in the 1920s. That's right, the 1920s, the era of Chicago's infamous gangs and Al Capone. It won't be long before all that is "a hundred years ago." Time flies. Early skyscrapers were quite ornate with amazing pinnacles in the sky. From left to right are the InterContinental Hotel with its interesting onion dome, completed in 1929, the Wrigley Building of chewing gum fame, built in 1924, and the gothic-style Tribune Tower which dates from 1925. Those were the days of glamorous skyscrapers that dared to approach the lofty height of forty floors (in fact, the InterContinental Hotel has forty-two). Yes, there were taller buildings (like the Woolworth in NYC), but they were few. Can you tell that I was an architecture student? Always looking up at buildings. I'll try to mix it up a bit in the coming days. This is the third in a brief series of photos that I took while visiting Chicago in June 1996. They're 35mm color slides that I've scanned and digitized. Once the tallest building in Chicago and the United States, the striking John Hancock Center's rank has fallen to fourth and sixth, respectively. It currently ranks as the twenty-seventh tallest building in the world. No matter, the Hancock Center's design with its exterior X-bracing makes it distinctive among the world's skyscrapers. 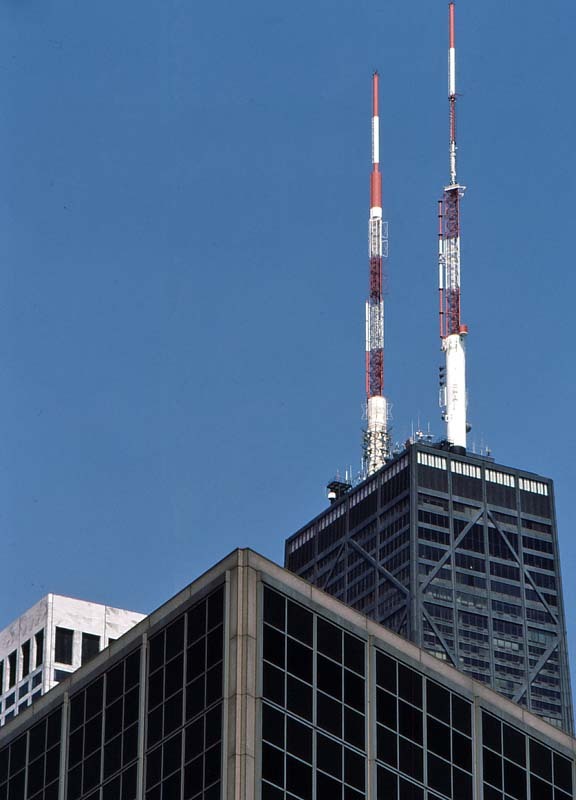 The John Hancock Center (right) with its distinctive bracing and twin antennas. I once heard that those of the building's seven hundred condominiums that include a diagonal brace element in their windows actually went for a higher price than those that don't. I can't verify that it's true, but it sounds like a good marketing ploy. In addition to condos, the one hundred story building includes offices and restaurants. I've been up in the observation deck once and to one of the incarnations of a bar up top another time. When we went up to the bar, the welcome was less than warm. Obviously the bar is a popular tourist destination, and it was very crowded. The staff made the crowded conditions worse by treating us and others as if we were bothering them. They made it clear that they thought we were privileged to be allowed to spend our money there. We didn't stay long. Still, it's a pretty neat building (notice the use of highly technical architectural terminology there). This is the second in a brief series of photos that I took while visiting Chicago in June 1996. They're 35mm color slides that I've scanned and digitized. Chicago is. Since I don't have a lot of new photos of France right now, I thought I'd take us on a little trip down memory lane. In June 1996, Ken and I went to Chicago. He had a conference to attend and I tagged along for fun. While Ken worked, I ventured out and took pictures. 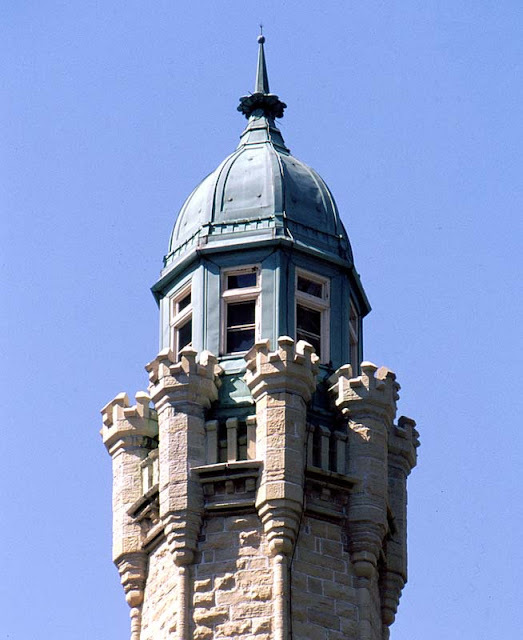 The top of Chicago's landmark Water Tower. I didn't venture far, only in the loop and up Michigan Avenue a bit. I was on foot and it was hot and humid. But I had fun. Boy, would I love to go back and spend some more time exploring. Chicago has changed a lot since I first saw it in 1982. It's changed some more since these pictures were taken, nearly fifteen years ago now. This first one is the famous Chicago Water Tower. It's up on Michigan Avenue and was built in 1869. It's one of the few buildings to survive the great fire of 1871. Its base, not in this picture, looks like some fantasy castle. I read on Wikipedia that its design inspired the architecture of the famous White Castle hamburger chain. So get ready for a series of not-so-recent Chicago photos. These are all 35mm color slides that I'm scanning and digitizing. I am retouching them using Photoshop, mainly to crop and correct the color (the scanning process sometimes changes the original colors). Bear with me. This is an old image of Paris that I took back in the days before I had a digital camera. 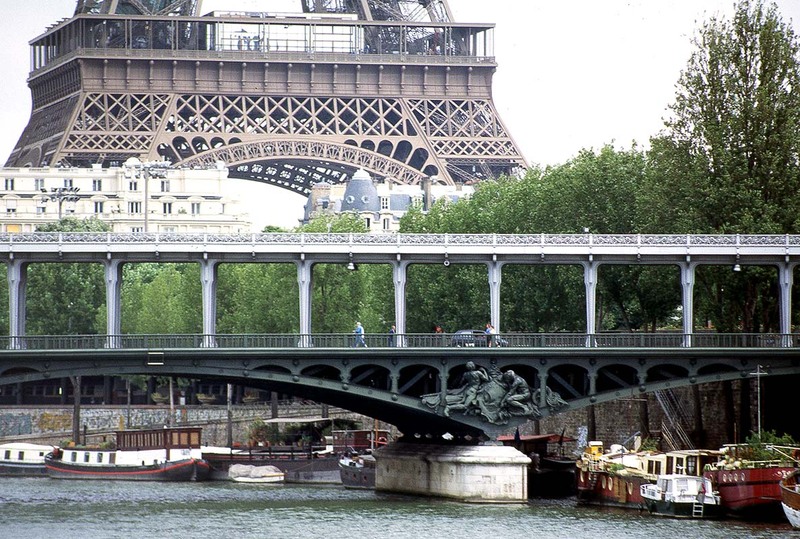 I believe that I was standing on the Allée de Cygnes, a narrow island in the Seine River, looking back across the Pont de Bir-Hakeim toward the Eiffel Tower. This had to be taken sometime in the 1990s. The southwestern side of the Eiffel Tower. The bridge was completed in 1905. The bridge is one of my favorites in Paris because the métro runs along the second level after emerging from a tunnel on the right bank. The views of the tower as you ride across the river are spectacular. I scanned the original 35mm color slide and worked on the contrast a little in Photoshop. If you dig through the archives of this blog you can find a lot of my old Paris slides, digitized and enhanced with Photoshop to give them a second life. The days are dark and dreary right now, punctuated here and there by an occasional ray of sun (as if to tease us). Whenever I venture out, either on an errand or to walk the dog, it's either rainy or foggy or otherwise too dark to take photos. But, looking on the bright (ha!) side... the days are starting to get longer and we will have sun eventually. January always seems to drag along slowly. 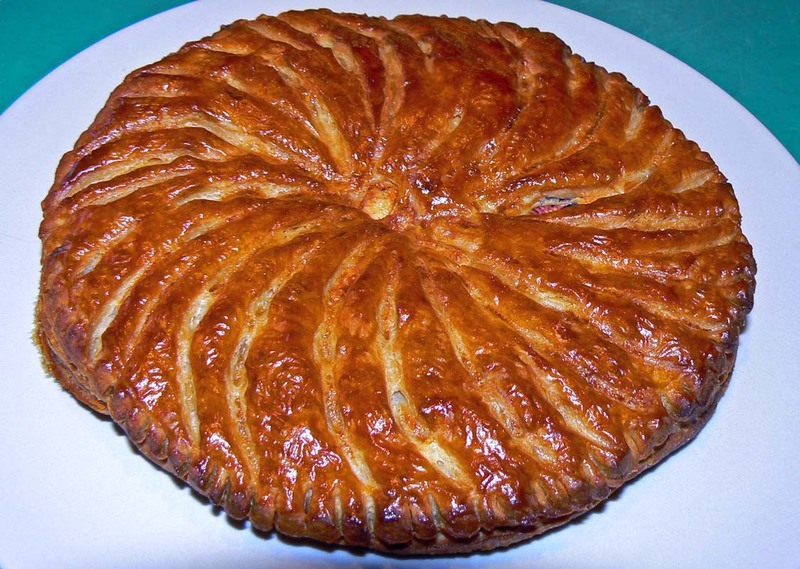 In the first days of January, to mark the epiphany, French people eat a cake called une galette des rois (a kings' cake). When you buy one, it comes with a paper crown. Inside the cake is a little toy, usually a ceramic thing and these days it's often in the shape of a popular cartoon character. Whoever gets the slice with the toy (called a fève in French) is king for the day and gets to wear the crown. The year's first galette. You can see the fève peeking through just to the right of center. The cake is made with pâte feuilletée (flakey pastry) and is traditionally filled with frangipane (sweet almond paste). The galettes that the bakeries sell are very good, but they cost a small fortune these days, and the ones you find in the supermarkets just aren't very good at all. So a couple of years ago I decided to make my own. The most time consuming part of the process is making the feuilletée from scratch. You can buy some already made, but I like doing it myself. I usually dedicate a day to making the dough, but I make enough to freeze and I get two or three galettes from it. I also make the frangipane, which is just ground almonds, eggs, and sugar. And, since I've saved the fèves from every galette we've bought in a bakery, I slip one of those inside my cakes. I haven't made any pâte feuilletée yet this year because I had enough for one galette already in the freezer. So, on Monday I made one. I got a little carried away with the decoration on top and the fève actually ended up visible. No fun in that. 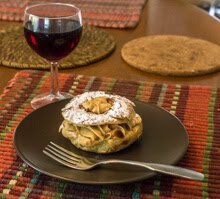 I'll be making more feuilletée later over the weekend and we'll eat at least a couple more galettes before the month is out. Here's a link to the one I made last year, with the recipe. For the guest room. A few months ago we found a good deal on a pair of bedside tables at Ikea. Since then we've been keeping our eyes open for a pair of lamps to complete the room. I wanted something slim and somewhat tall with a shade that wouldn't be in the way. Most of the lamps that attracted me were too expensive to consider, or if the price was ok, there was only one lamp left. That's our previous dog Collette in the frame (photo taken in San Francisco by our friend Sue). 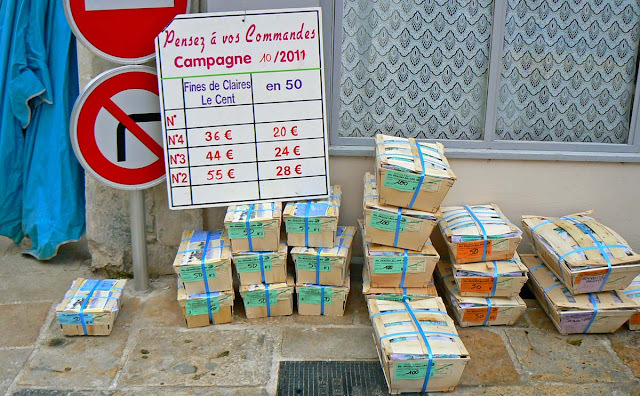 But we found these just before Christmas at our local Bricomarché. We both liked the look and the price was right. So we brought them home. The color of the lampshade in this picture is not quite right. I tried adjusting it with Photoshop, but I just couldn't get it to look like it should. 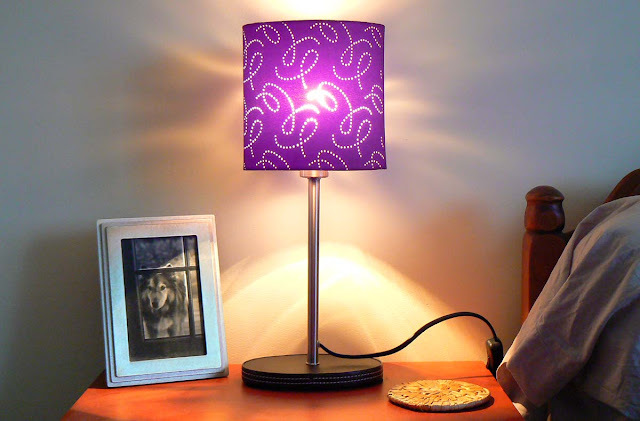 The shade is actually brown, pretty much the same color as the lamp base, but the photo makes it look purple. It must be the energy-saving fluorescent bulb that's messing up the image. I could probably adjust the settings on the camera to compensate for fluorescent light and re-take the photo, but I'm too lazy. You'll just have to use your imagination. I've been showing a lot of photos from the markets in Saint-Aignan and Montrichard recently. And they are certainly nice, but I don't want you to think that we shop exclusively at the pretty outdoor markets. Oh, no. We spend a fair amount of time with everybody else in the local supermarkets. 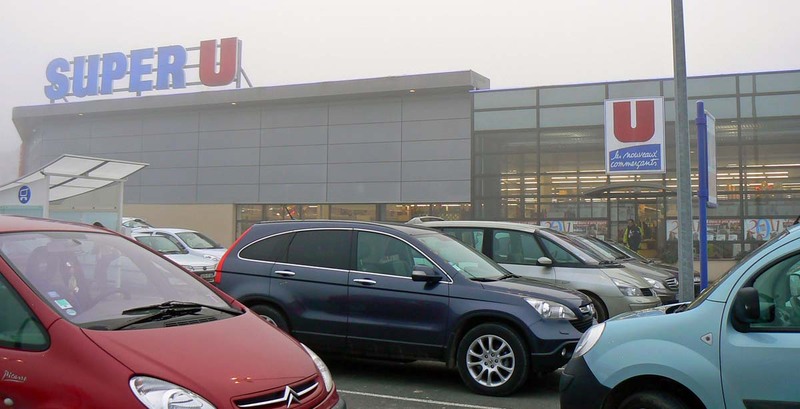 The recently expanded Super U supermarché in Saint-Aignan. The nicest super around us right now is the Super U in Saint-Aignan. The store is well stocked, and they have good produce, meats, cheeses, and even fish. There are some international products that we like to get from time to time, and of course you need the super when you want to buy toiletries and household items like cleaning products and bin liners (garbage bags). Not to mention pet food (yesterday I got dog kibble, cat food, and bird seed for the outdoor feeder). Our Super U manages their checkout lines very well. And people there are quite friendly. I did a Super U run on Monday morning. The fog was very thick and freezing, but the roads were clear and dry. I combined my trip with stops at the post office, the bakery, and the Ed discount super for a few items that U doesn't have. Here's another photo from the fish monger's stand. These are oysters boxed up in quantities of thirty, fifty, or one hundred. I'm not sure if they're for sale or are filled orders waiting to be picked up. The sign advises customers to think about placing orders for the 2011 season, along with prices for various sizes and quantities. Oysters boxed up and ready to go for New Year's eve 2010. I'm not planning that far in advance. The fish monger. Our Saturday market in Saint-Aignan is not big, but it has most of the essentials. A couple of charcutiers, a few green grocers, a woman who sells mushrooms (and only mushrooms), a baker, a guy who sells prepared Asian food, two poultry vendors, a horse butcher, someone who sells snails, a great cheese vendor, and a darned good fish monger. 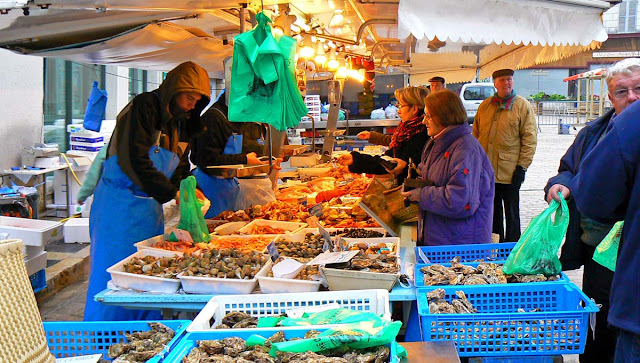 The fish stand at the St.-Aignan market, New Year's eve 2010. Click to ichthyolate. The fish people come all the way from the west coast of France every weekend for our market. That's got to be a four hour trip each way. Apparently, the woman who owns the business with her husband is from our region. They have a good long line here every Saturday morning and they sell just about everything from the sea. It's all fresh and gorgeous. Mackerel, cod, herring, salmon, tuna, sea bass, squid, shrimp, prawns, lobsters, crabs, sea snails, mussels, several varieties of clams, and other fish I've never heard of. And this time of year, they sell oysters for the holidays. Happy New Year! On New Year's eve in France it's traditional to eat oysters, so we did. There was a small market in town on Friday morning; only a few vendors were there. But the regular fish monger was there and had the usual bins and baskets filled with huîtres (oysters). 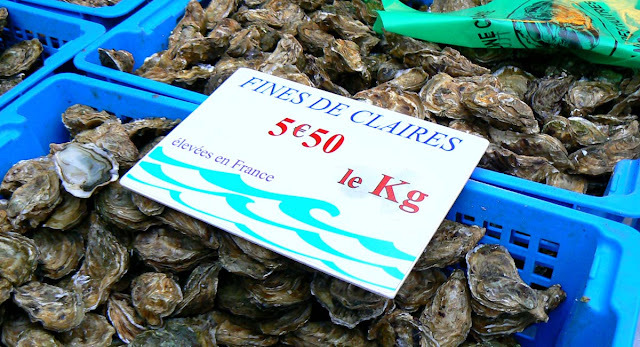 The oysters they sell are farmed out on the west coast around the Ile d'Oléron and a town called Marennes. The closest large city is La Rochelle. It's one of the very well known oyster producing areas on the French coast. We got ourselves a dozen flat oysters and one and a half dozen fines de claires. Ken made a mignonnette sauce (shallots, vinegar, and black pepper) to accompany them along with buttered rye bread. What a feast!